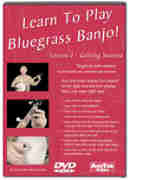 Includes Learn To Play Banjo Lessons 1, 2 and 3 in a 3 DVD set. D-LPB-1, D-LPB-2 and D-LPB-3. Download now from PlayBetterBluegrass.com!